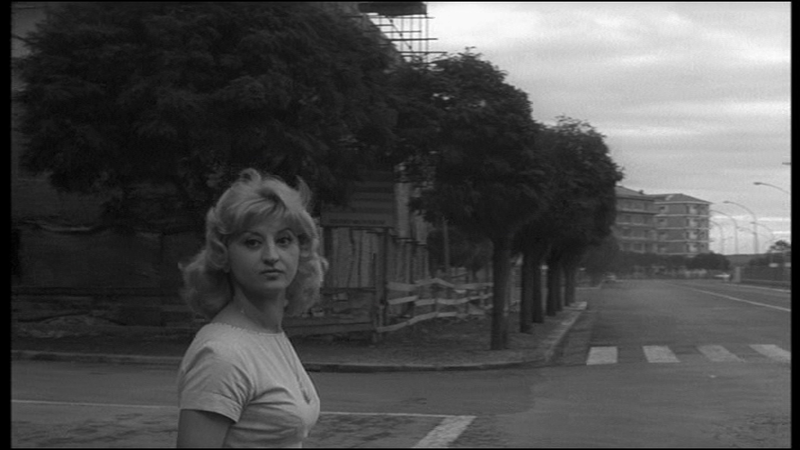 I was talking about this celebrated bit from Antonioni’s L’ECLISSE to students the other day (it allowed me to steal Benny Hill’s joke about knowing how to spell Antonioni but not knowing when to stop) and I thought I’d write it up. So, at this point in the film, Monica Vitti and Alain Delon have met several times at this particular location. On this occasion, neither one of them turns up. 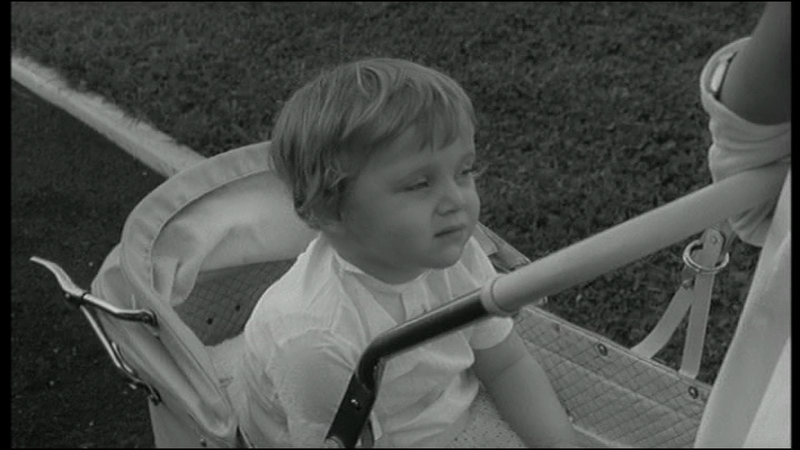 But Antonioni, who is nothing if not diligent, does, and presents us with what happens, or fails to happen. The scene, a movie deprived of its stars, resembles a documentary in some ways (because those could be foolishly defined as movies without stars) but is obviously created with complete care and artifice. Without any real subject, it becomes about time passing. It’s also possessed of a various narrative tension, which I will try to unravel. “If you want reality, go out and look at the street corner — it’s boring!” Orson Welles once told an actor in the theatre. And Orson DID NOT care for Antonioni’s movies, denouncing the maestro’s tendency to linger on things. Though he may well have been thinking of the last shot of THE PASSENGER, a long take very different in effect from those in his own works, and one that takes forever to imperceptibly deliver a startling conclusion in a quite indirect way, this scene, a portrait of a street corner, would seem to be Welles’ nightmare come to life. Why do I find it so electrifying? Even when extracted by Martin Scorsese for his Voyage to Italy documentary, it thrills. 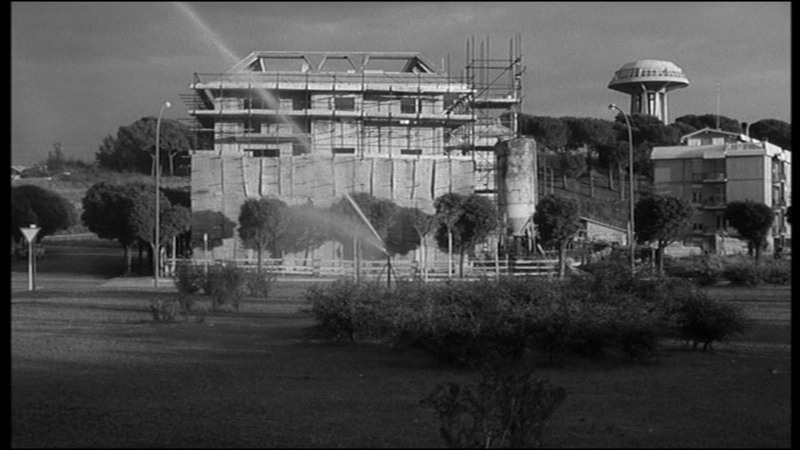 Antonioni opens (cutting directly from the previous scene, which DOES feature Vitti) to a nursemaid pushing a pram, then pans to a view of the construction site with water jetting in front of it. The particularities of the view, especially the space-age structure in the distance, already hint that a street corner might be more interesting than it sounds. The perverse pan, motivated by nothing we can understand, takes us away from the most human part of the shot, the nanny, and shows us, arguably, nothing. So we’re aware of the camera’s behaviour already — like the prowling lurker of a horror movie, it has its own will and roves about, unseen by the pedestrians, intent on business of its own. Antonioni now follows a stratagem repeated throughout the sequence, cutting in to a detail — often, this is a detail established in a wider view, but here, the heap of concrete misshapes (a miniature city of the future, a Max Ernst decalcomaniacal landscape) is merely something whose existence we might infer from the previous picture. Like the good little slaves of Kuleshov that we are, we are forced to assume a connection between the two. MA then serves up a wooden fence, retreating at sharp perspective, and by now a definite tension is building. This looks like a shot that should be inhabited. 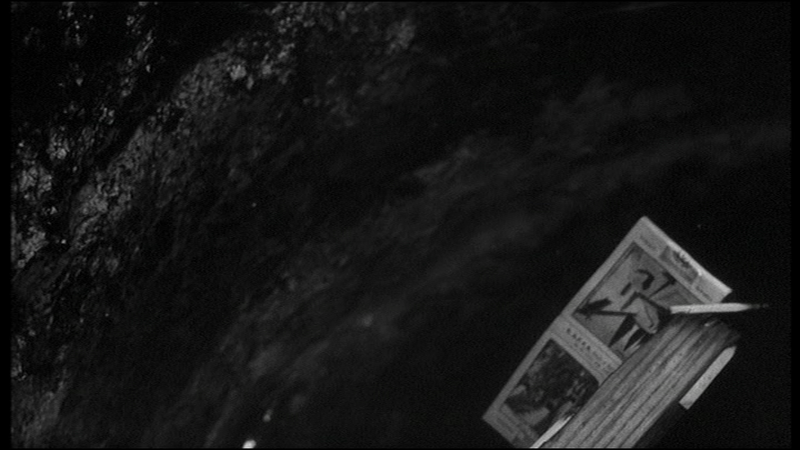 And we’ve had what ought to have served as an establishing shot, then two detail shots, and still nothing. Because film scenes by definition are supposed to have things happening in them, an audience in 1962 as today would surely start to feel antsy around now. 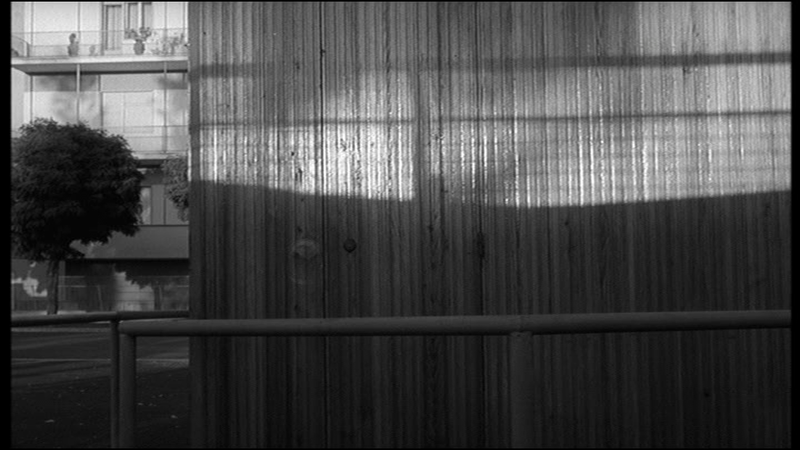 1) — would be Ozu, who famously uses shots that are positioned somewhat like establishing shots but which refuse to behave exactly right. 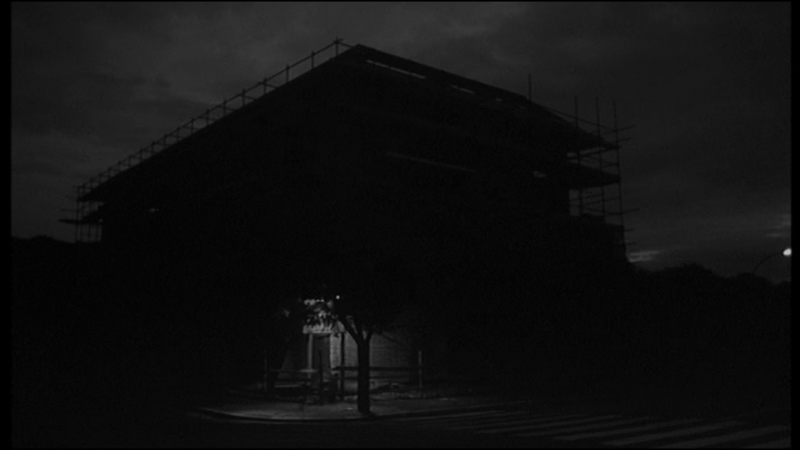 If, as DePalma has argued, “establishing shots are a waste of time,” (he has a point — if all the shot is doing is setting the scene, you haven’t chosen an effective beginning), then Ozu’s shots waste far too much time to even qualify as establishing shots. 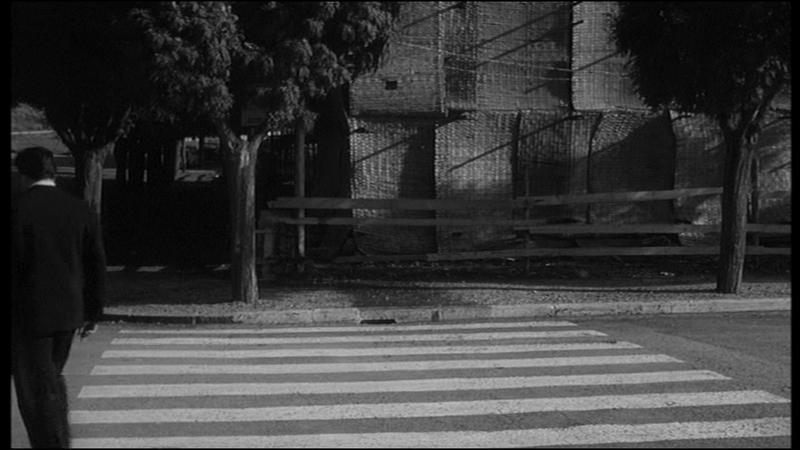 They take us on a dance through space, as Antonioni has just done with his building site / breeze blocks / fence barrel juxtapositions. 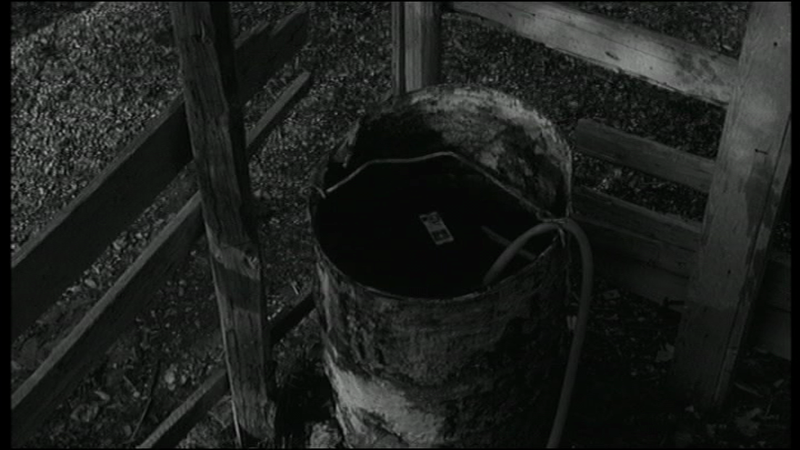 2) — would be my man Lewis Milestone, who uses a similar shot of a water barrel as part of a sequence of details at the start of RAIN — details which recurs as the film goes on, showing the passage of time via the developing rainstorm. Though experimental up to a point, Milestone’s inserts conform sufficiently to Hollywood narrative norms by virtue of being brief. Wonderfully bleak and denatured. A shot that positively screams out for a passer-by to give it meaning, intent, direction. It’s not even ideally frames as a shot of a zebra crossing. There’s a tree AND a sign in the way. The lady with the pram now a distant memory, this begins to feel like Rome after a neutron bomb strike. 3) Stanley Kramer’s ON THE BEACH came out in 1959. It’s vast shots of an empty city are memorable, and rather surreal, since the concept of the neutron bomb didn’t even exist at the time. Modernism! This low-angle on the half-constructed building shrouded in a weird wicker-like covering manages to suggest a definite POV of an unseen spectator and a likeness to a modern art abstract sculpture. How does Antonioni really feel about brutalist architecture? I know it’s a vital symbol of the anomie he anatomizes, but he’s so visually excited by it that I can’t believe he doesn’t love it a little too — like Tati and the gadgets and towers of Tativille. Would you give your name to a fictional city you didn’t love? 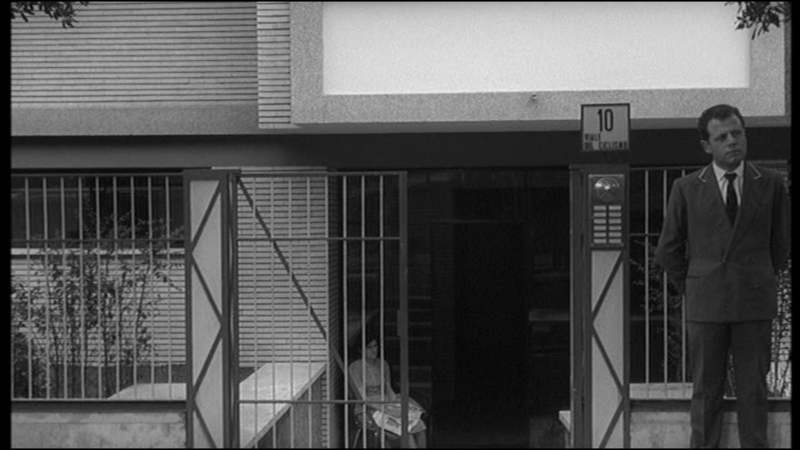 Is there a street or apartment complex or multi-storey car park named after Antonioni? There should be. The next shots dance around the site’s scaffolding, the upper reaches of which form a naked skeleton of a building as seen by X-Ray Milland, or a climbing frame for giants. Clouds drift, the most alive things we have seen lately. 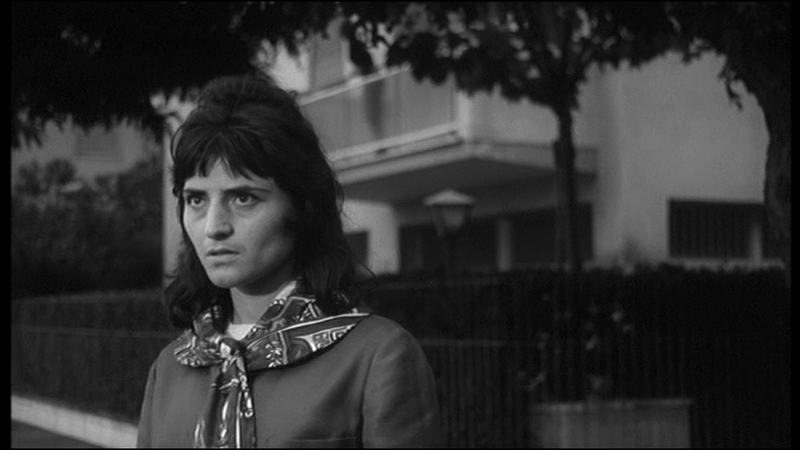 And then Antonioni returns to street level, without the aid of a visual link, signalling the start of a new movement in this near-silent city symphony. A tree. Empty space behind it. And then a horse and buggy canters through frame, pulling our eye left, where we pause to pick up the nanny and pram again, a clue that this has not been a montage of empty hours, but is an ongoing glimpse in near-real time of a quiet street. The sudden fast action and a shot which, for a few seconds at least, actually follows a subject matter, startle us awake. Shadows of trees on the ground. A lovely frame, but in my DVD at least, it’s a freeze-frame, a still photograph, with big un-moving grain, making it stick out rather unattractively. Oh well, as Sidney Lumet once said, “Nothing has to be perfect.” The next shot, artfully lit asphalt, makes up for it. 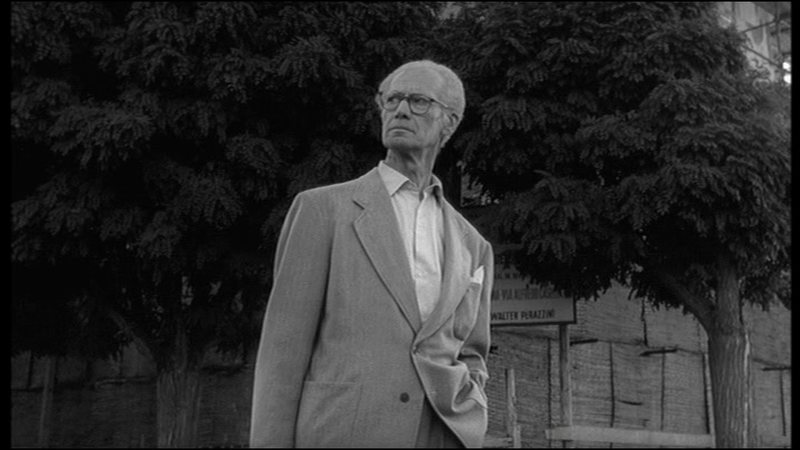 A real horror movie image — peeking from behind one side of a kind of shed-like structure on the building site, with just a sliver of street visible, Antonioni tracks laterally past the building in order to peek from the other side. Hiding behind stuff (like Sidney Furie, or an Indian), when coupled with an unmotivated, prowling camera move, says ALIEN to me. A bunch of iron guard-rails look like the kind of things you see in cities without suggesting to me a definite purpose. They make me nervous. The zebra-stripes on the road finally get their own product shot, only to be upstaged by a stocky chap in a suit who walks right across them, with a determined gait, and out of the film. Goodbye! Goodbye! Oh — we revisit the fence, and there goes what looks to be the same chap, still bent on escape. Will we pursue him further? We will not — the trees in the background have begun to billow about, Antonioni having brought in some aircraft propellers (NONE of this stuff is accidental, I tell you!) 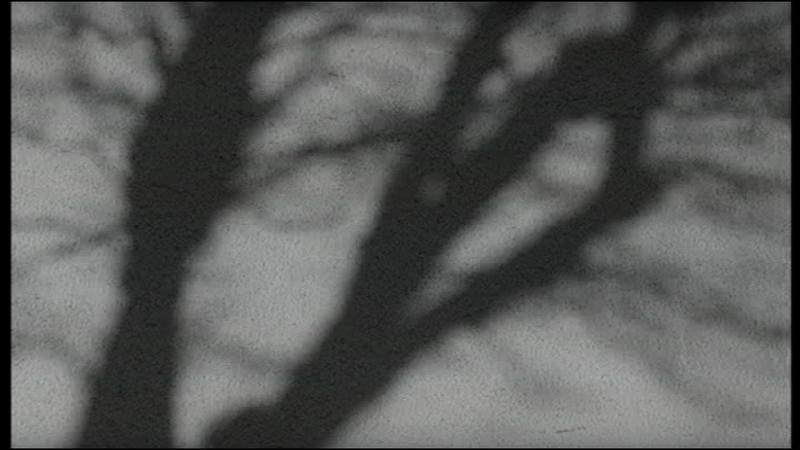 and this motivates a clear cut to the leafy branches undulating and sussurating and inspiring David Lynch. 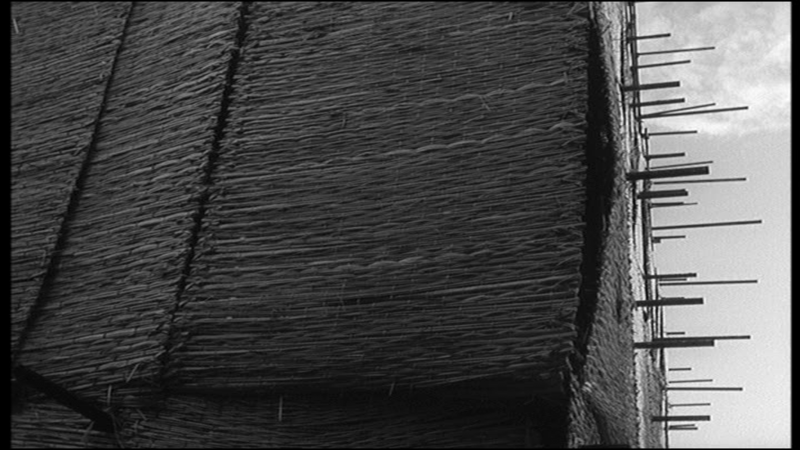 And that leads logically yet intuitively to a closeup of gnarly bark, crawling with ants. 4) NORTH BY NORTHWEST. We know Hitchcock was well impressed with Antonioni and planned a pervy colour-supplement style movie, KALEIDOSCOPE, in which he would attempt to outdo the maestro. Did the influence run the other way? Well, I would argue that the concept of BLOW UP — a photographer may have witnessed a murder — perhaps owes something to REAR WINDOW. For most of its running time, REAR WINDOW is an exercise in ambiguity, with the offscreen events tantalisingly unknowable. BLOW UP drags the ambiguity out past the end of the film. 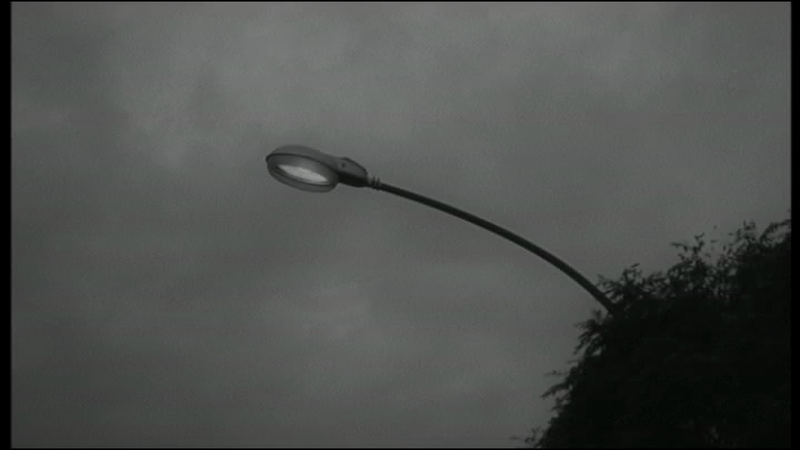 In NXNW, Hitch created abstract suspense out of Cary Grant waiting for a bus on a prairie. We have reason to suspect he will be attacked, but no clue is offered as to how. Each time a possible avenue of narrative interest is produced (a car passes, another car stops, a man gets out to wait for another bus, the bus comes), the film shuts it down. Until the crop-duster attacks, but I would imagine Antonioni would lose interest at that point. So, a bus is coming. 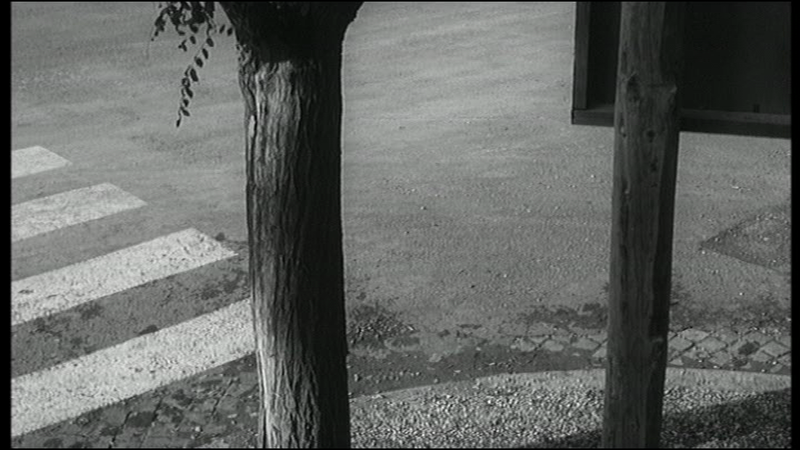 Antonioni starts to tilt down to follow it. But then he gets carried away and tilts so far he loses the bus altogether. He looks at the zebra crossing again. We wait for the bus to pass through frame. 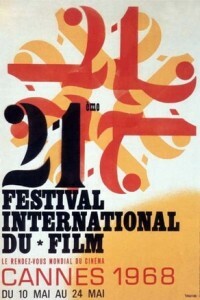 Antonioni cuts before it can. But he cuts to the bus, or to *a* bus, anyway, one that has parked and is now moving off. A wide shot shows us just how empty the place is without it. The rain barrel is leaking! The floating matchbox and stick will soon be deposited at the bottom. This is possibly the most exciting thing to have happened so far. How did the steel drum spring such a dramatic leak? An actual event appears to have happened while we were preoccupied with that bus, like bloody fools. A second shot from outside the barrel and from the other side of the fence shows the water spouting and puddling, and we track with the flowing fluid, according it a narrative import that bus apparently didn’t merit. We end on the gutter. People! But only up to a point. Figures, more than characters. The bloke is so far to the right we know he’s of marginal significance. She’s so still and small we take a moment to spot her. The flat architectural view and the further flattening of the long lens and deep focus make the pair seem like a dwarf and a giant. Both seem to be waiting. Another waiting lady ponders what it all means. She seems to be at a bus stop. You just missed it, lady! Scowling woman. Out of focus behind her, a woman leans out on their balcony. 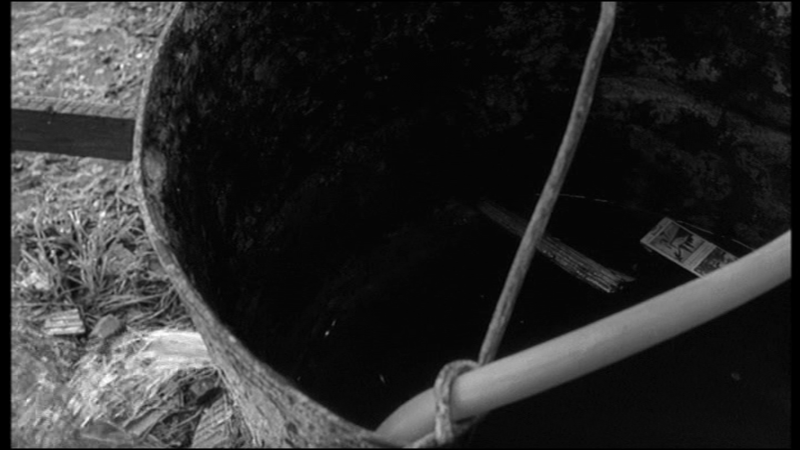 A distant detail that feels almost accidental, as if accidents were possible in this designed mise-en-scene. Her new posture frames her perfectly through the intermediate foliage. A second shot shows the pensive scowler standing off the curb, handbag dangling. Stood up? We know the feeling. You might have been stood up for a movie, miss, but have you ever been stood up BY a movie? As she turns, hopefully, a bright flash pops up for a frame or two almost in the centre of the image. A flaw in the film, a momentary reflection, or something more numinous? The bus passes. It’s not what she’s waiting for, but we get an ominous shot of its wheels. 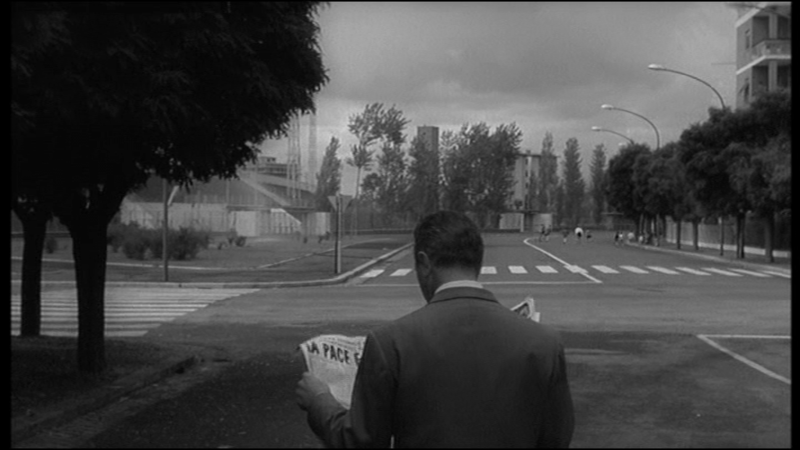 Antonioni sets up a peaceful shot of poplars in front of the apartment blocks, then rudely occludes it with the bus, hissing into shot and disgorging passengers, one of whom opens a newspaper and flashes us a headline about some ongoing atomic conference, where no doubt the Russians and Americans are trying to agree how many ICBMs it takes to destroy all life on earth and how many more than that each of them needs. This slightly leaden bit of political reference does make me think I was right to think that the H-bomb was partly on Antonioni’s mind with the depopulated frames. THE ATOMIC RACE. THE PEACE IS WEAK. The chap breezes off with his doomsday rag into a vista that suddenly reminds me of the futuristic London in George Pal’s THE TIME MACHINE, right before it gets obliterated by nuclear death from above. In the distance, children are playing. So Antonioni leaps in close to them and shows them running through the water spray, which we had quite forgotten about. Has it been jetting away all this time? In long-shot, a workman arrives and shuts it off. It was too much fun for this movie. BEAUTIFUL shot of hedgerow leaves dripping with droplets, glistening — this takes us to a big shaggy tree with lamp-post and nice blocky modern apartment building making lego shapes against the sky — Antonioni can’t resist jumping in and offering up closer views of some of those staired shapes. In three cuts he seems to ascend the building and ends on the sky with radio tower and vapour trail slicing across. Back on the building, somebody points. “Look, boss, the plane! The plane!” The vespertine atmos is so dreamy its overwhelming. So crepuscular it’s almost muscular. The next shot has us plunged back to the base of this building. And then a woman enters shot. Her hair is like Monica Vitti’s hair! It must be Monica Vitti, from behind. You know when you wait for somebody and get crosser and crosser when they’re late, but then when they show up you can’t help forgetting to tell them off because you like them and you’re glad to see them? but then she turns around and it’s not Monica Vitti at all, and we get that uncanny lurch like that time when I was four and got lost in the supermarket and the woman I thought was mummy turned round and wasn’t mummy. The non-Vitti woman has a spectacularly disappointing face. The poor woman must have been hand-picked out of thousands. Still, at least she’s not a dwarf in a mac with a butcher’s knife. Big ECU of the contents of the draining drum. Makes me think of Godard’s coffee cup, macro view like a spiral galaxy disintegrating in the heat death of the universe. Huge views of sidewalk, shallow water surging across in little ripples magnified to seem like great swells. Big shot of neck and jowl. Something of a shock, and only the giant size seems to link it to the previous moments. MA follows it with a giant spectacle — I don’t mean like the explosion at the end of ZABRISKIE POINT, I mean literally a huge one half of a pair of spectacles, a close-up detail of the owner of the neck. 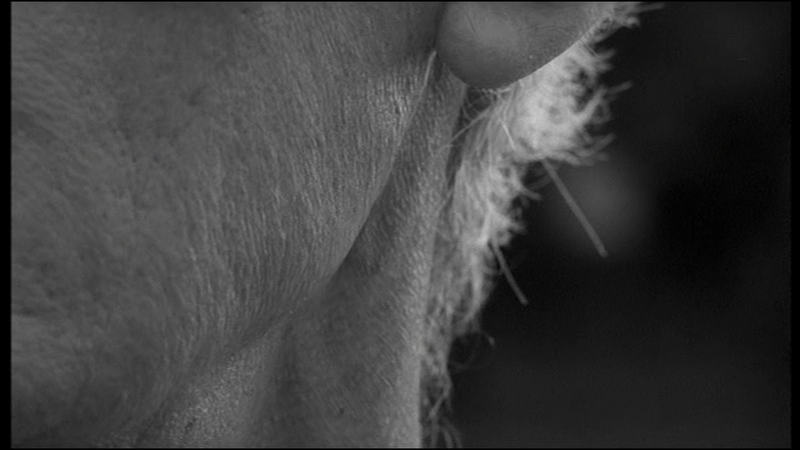 Then a big head, spiraling up from bottom of frame, allowing us to enjoy the neck and specs in context. The epic treatment of a person is exhilarating, and just when you think it can’t get any better, Antonioni afford the fellow a medium shot, a low angle in which his turtle-like head seems dwarfed b its suited body, a bit like the crazy image of Spike the mutant baby poking tadpole-fashion from a gaping collar in ERASERHEAD. The momentary star of the show walks off and we reframe on a nice couple of trees. That draining water has created mud. And a kind of fissure in the earth’s surface, its size impossible to determine. A tiny crack suitable for an ant, or a vast sinkhole ready to swallow an apartment complex. A baby. Waiting. In a pram. What, you’re still here? It feels like the evening has advanced considerably, but baby’s day out is still in progress. Nanny pushes off. The sun is low in the sky, pushing through a blotch of cloud, silhouetting the sports field floodlights. A woman looks up, her face framed through bars. A streetlight comes on — always a magical event if you happen to be there to spot it (despite living in a city, I hardly ever seem to see this daily event happen). Wide shot of broad avenue, busier, darker, with streetlights on. Abruptly it’s quieter. A bus drives through, alone. Leaving emptiness again. We discover it parked around the corner. A small crowd disembarks and we follow their dispersing backs into the urban gloaming. A magical image of night — photographed late magic hour so the sky is still faintly illumined so as to outline the city. Another pan off to the side, following nothing, drawn by forces unknown. The abrupt, violent glare of a street light in ECU, washing out it’s surroundings. 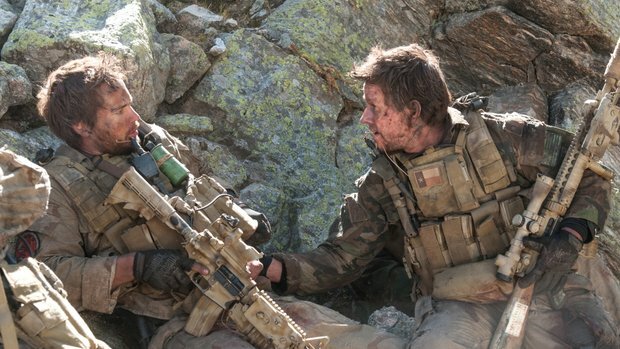 You could play a pretty good drinking game with LONE SURVIVOR, the worrisome Afghanistan conflict story. Simply take a shot anytime any character says something optimistic (e.g., “We’re going to be OK,”) and then gets shot in the foot. A shot for a shot. You would die of alcohol poisoning before the halfway mark. Alternative title: MARK WAHLBERG SLOWLY BECOMES A POBBLE. The movie is excitingly-staged warnography, and gave me a very bad feeling. 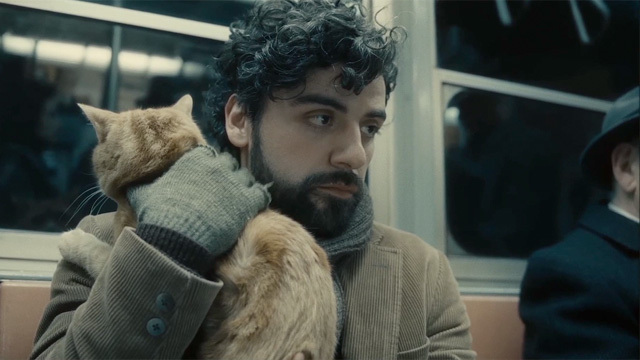 One way of looking at INSIDE LLEWYN DAVIS is as the feline version of Clint Eastwood’s THE CHANGELING. Actually, apart from the who serial impregnator thing, and some nasty heckling of another act late in the story, Llewyn’s dickishness seemed entirely justified to me. Maybe that’s why I’m not a bigger success in life. The only person he doesn’t offend, really, is F. Murray Abraham (always a welcome face, with the best scene in the film) — I guess because Abraham makes it clear he’s not offering any help. Llewyn only alienates people who might help him. Is that a character trait or a plot device?